Summary: Ryder and Falpian are two teens from the warring Witchlander and Baen people. Raised to hate each other and to believe in different deities, when they come in closer contact and realise they are linked through a mysterious mind connection, their first instinct is to kill one another. But when Falpian’s father tries to have him assassinated and the witches from Ryder’s community won’t acknowledge that his mother Mabis can see the evil that will soon befall them, Ryder and Falpian must find a way to work together to unravel the secrets surrounding the contention between their people. Both sides seem to be trying to rekindle the war, and it is up to Ryder and Falpian to stop them. 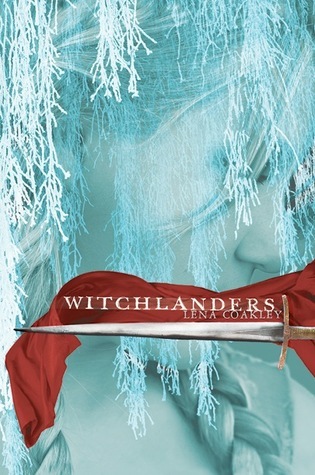 Review: Wrapped in a vivid fantasy-genre story about two teens from different lands is wisdom and insight applicable to modern day life as Lena Coakley tackles religion, racism, gender equality and class systems through her novel, Witchlanders. Coakley’s talented writing immediately immerses her reader into a world where mystical powers are real and people can shake bones to predict the future and sing spells into existence. And yet it’s relatable. Ryder’s tale begins with his family life. His father has died and he is taking care of the farm as best he can while also trying to stop his mother from taking Maiden’s Woe, a powerful narcotic type plant that she says helps her see the future. Ryder is focussed on taking care of his family at all costs, but when that means he has to leave them to defend the community he is willing to do so for their ultimate good. As for Falpian, the disappointment of his father and the death of his twin brother weigh on him heavily. It takes courage for him to not allow himself to be killed to start a war as his father intends, and being open to collaborating with a Witchlander takes a lot of empathy and a willingness to see the bigger picture without turning away in fear. I loved the mystery surrounding the deities and the lengths the witches go to in their efforts to cover up the truth. If the Baens and Witchlanders were allies instead of enemies, would they each have a talat-sa? What an incredible idea to promote understanding between the peoples as each person shares their talat-sa’s memories and experiences! Since each group has their own deity/deities and one seems to be bent on putting women down at all costs (read my Memorable Quotes section, Coakley’s portrayal of this is so powerful and filled with hatred it is frightening) I would think being able to see into another person’s mind would be the best way to make them see the other side of things. I was so disappointed to read there is no Witchlanders sequel in the works, because reading Coakley’s book for the second time just reminded me how much I love the story and of my desire to know more about Kar and the Goddesses. I love the little snippets of backstory Coakley provides through her quotes from The Magician’s Echiridion, and this is definitely one of those times where I am jealous of a writer for being able to invent such a rich world and having access to it all of the time. I won’t know more about the Witchlanders and the Baens unless Coakley writes another book, but Coakley created her characters and can think about the other adventures they might have whenever she wants. My favourite character was Bo, the dreadhound, because he’s so loyal even when Falpian is convinced he is being loyal to the wrong person. Plus I just loved Coakley’s description of him being a bundle of fur in the beginning. Easy to imagine, and so endearing. Coakley’s description of Falpian being caught in a tunnel with a large number of spiders was also vivid, but not endearing as it made my skin crawl. As I recall, this was a book that did well on the White Pine reading list, and it is one I would recommend to male and female readers alike. Even if you’re not usually a fantasy reader, Coakley’s writing transcends the genre and is highly enjoyable for all. “Cursed are those who believe in a Goddess, who cannot see that a world created by a woman would be a backward place, that rivers would run uphill, animals would rule over humans, the sun would give off darkness instead of light. But worse still is the Baen woman who tries to sing. Remove her from the company of other women. Cut out her voice, and fill her mouth with mud. Witchlanders by Lena Coakley is published by Atheneum Books for Young Readers, (2011).